The American Consortium of Universities (ACU) is a group of accredited institutions of higher education with superior programs and features. Its members serve the educational needs of thousands of international students from around the world. The scope of ACU’s offerings is varied, and far-reaching, ranging from associate degrees to doctoral programs in numerous fields, including advanced science, engineering and technology, and programs as diverse as accounting, engineering, law, business administration, textiles, nutrition and sports medicine. ACU is not just about strong academic programs. International students flourish in institutions committed to international education, as evidenced by the resources — people, facilities, support services, etc.– they devote to it. That commitment stems from a mission, not only to help international students excel educationally but to enlist their contributions to enrich academic and learning environments for American students. It also comes from ACU institutional programs to send American students to other countries to study; their cultural learning leads them to be better global citizens and fellow students with international students when they return. The American Consortium of Universities (ACU) facilitates international student admission to graduate and undergraduate programs at its member institutions, which offer a wide range of excellent academic programs and services. Assistance to students in achieving fluency in English and adjusting to the new academic and cultural environment is provided by the INTERLINK centers on each campus. Valparaiso University Valparaiso University (Valpo) is a private university of 4,500 American and international students from the US and 40 countries worldwide. Consistently ranked as one of the Midwest’s top universities, Valpo is listed among those universities in the USA offering the best value for price. Valpo has had a long and proud tradition of welcoming international students of all cultural traditions and backgrounds. Aiming to foster true international education for its students and faculty, the university offers many programs that engage students and faculty in cross-cultural dialogues, cultural exchanges, study abroad and service-learning opportunities. Valpo is located only one hour from Chicago in a safe, friendly town of 31,000. The University of North Carolina at Greensboro The University of North Carolina at Greensboro (UNCG) is a challenging, supportive, and engaged community that stands apart from other universities because of our shared value to “Do something bigger altogether.” We define excellence not only by the people we attract and the high level of achievement they pursue but also by the meaningful contributions they make. With a conviction to empower all, we have created a unique environment of collaboration and inclusiveness that fuels curiosity and passion. Our diverse community is joined together by an understanding that what matters beyond the lessons learned in the classroom is how they are carried forward to make a difference in our careers and communities. Integrating intercultural and international experience and perspectives into every student’s learning experience, UNCG is a global university in which people of any racial or ethnic identity, age, or background can achieve an informed appreciation of their own and different cultures. It is a community of actively engaged students, faculty, staff, and alumni founded on open dialogue, shared responsibility, and respect for the distinct contributions of each member. St. Ambrose University St. Ambrose University (SAU) is an accredited, comprehensive university, well-known for its commitment to academic excellence, the liberal arts, social justice, and service. Rated among the top regional universities, SAU offers more than 70 areas of study leading to bachelor’s, master’s and doctoral degrees. The most common areas of undergraduate study for its international students are Engineering, Computer Science, Business, and Management. At the graduate level, the programs with high international enrollment are the Master of Accounting, Master of Business Administration, and Master of Science in Information Technology Management. Indiana State University Indiana State University (ISU), a public doctoral research university offering undergraduate and graduate degrees in more than 100 majors, provides outstanding educational opportunities to students, enhances quality of life by disseminating knowledge through instruction and research, and fosters creative and scholarly programming. Montana State University Montana State University is located in one of the most spectacular college settings in the US. It offers all the advantages of a larger university with the friendly community of a smaller campus. Founded as a comprehensive, public land-grant institution in 1893, MSU is among the 50 most technologically-advanced universities in the world. Of its 16,440 students, 722 are international from 75 different countries. MSU’s low student to faculty ratio of 19:1 makes professors accessible and provides hands-on learning opportunities. MSU students can explore their interests, gain new perspectives, and obtain the professional edge needed to build a dynamic future. Seattle Pacific University Students choose Seattle Pacific University (SPU) for its rigorous academics, supportive community, stellar Seattle location, and a vision to engage the culture and change the world. SPU is a Christian university with more than 4,000 graduate and undergraduate students from 39 countries and 45 states. SPU graduates are known for competence and character, bringing about positive change in communities around the globe. INTERLINK Language Centers Success in today’s world demands increased cross-cultural competence and effective communication skills. Proficiency in a second language, especially English, is vital for international students and business people. To that end, INTERLINK provides a unique curriculum, inspired by learning theories, research, and practical applications. The INTERLINK experience enables learners to participate actively in diverse linguistic, academic, and cross-cultural settings. Individual needs and progress are carefully monitored, and throughout this process, learners receive encouragement, support, and assistance. 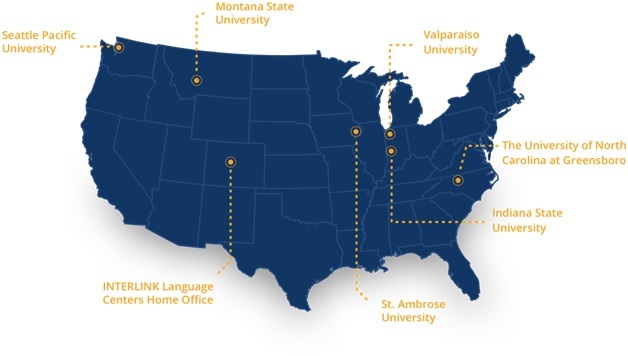 Located on the campuses of top-ranked U.S. universities, INTERLINK offers its students full access to all facilities and many academic services, including assistance with conditional admission to these institutions. Additionally, students can meet American students and professors, audit or take classes for credit, and experience university campus life. Throughout the students’ stay, dedicated faculty and staff assist them with their personal, cultural, and academic challenges. Academically qualified students who do not have the required proficiency in English may be admitted conditionally to an ACU member institution if they enroll at INTERLINK prior to the start of their academic studies. After successful completion of the program and upon meeting the conditions as specified in the initial conditional admission letter of ACU’s member institution, they may be admitted as regular students. Some ACU member universities require that students submit completed application forms, official transcripts from schools previously attended, documentation on finances, and perhaps letters of recommendation. Other universities only need to review official transcripts to decide on the conditional admissibility of a student. In all cases, one of the conditions will be either to achieve a specified TOEFL or IELTS score or complete the INTERLINK program successfully. Assistance in applying to universities is available free of charge to all INTERLINK students.